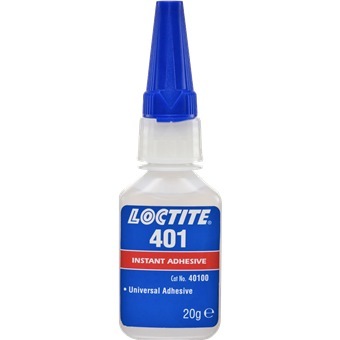 LOCTITE THREADLOCKER 401 (20GM) is rated 1.0 out of 5 by 1. Loctite ® 401™ Prism ® Low viscosity, surface insensitive, one part, room temperature cure, instant adhesive. Designed for the assembly of difficult-to-bond materials which require uniform stress distribution. Particularly suited for bonding a wide range of materials, including metals, plastics, and elastomers. Rated 1 out of 5 by Melee from Nozzles are stuck with dried glue I bought 6 bottles of LOCTITE Threadlocker 401 and when i wanted to use them the next day after receiving them, I found all the nozzles to be stuck with dried glue in them. Had to unscrew the nozzle in order to use the glue. Have sent my feedback to Horme Hardware but have not heard from them since.